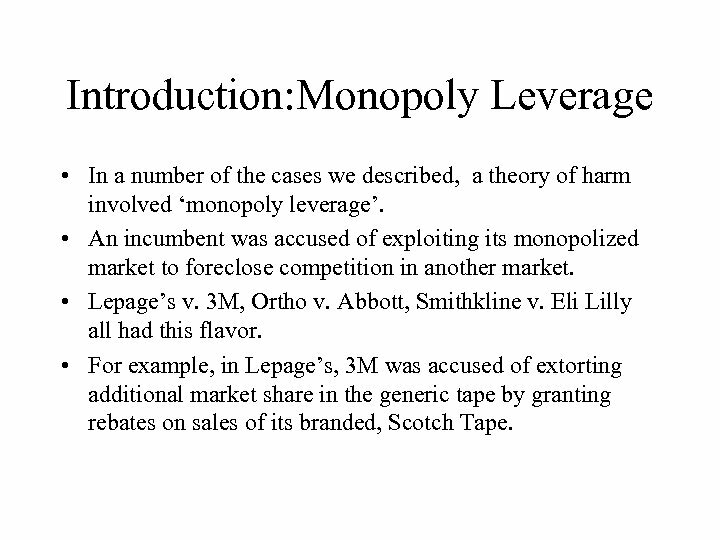 Introduction: Monopoly Leverage • In a number of the cases we described, a theory of harm involved ‘monopoly leverage’. • An incumbent was accused of exploiting its monopolized market to foreclose competition in another market. • Lepage’s v. 3 M, Ortho v. Abbott, Smithkline v. Eli Lilly all had this flavor. • For example, in Lepage’s, 3 M was accused of extorting additional market share in the generic tape by granting rebates on sales of its branded, Scotch Tape. 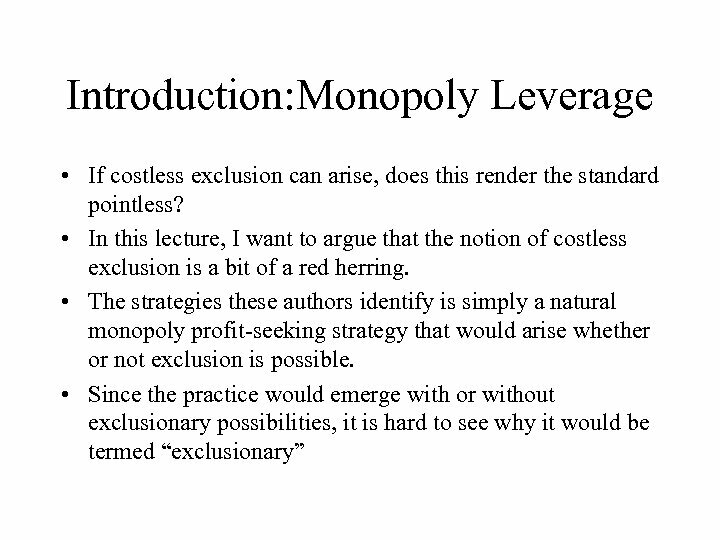 Introduction: Monopoly Leverage • However, the practice leads us to a further question. • These strategies can be shown to be dominated by much better and less distortionary strategies. • This fact leads us to ask, why are they used? 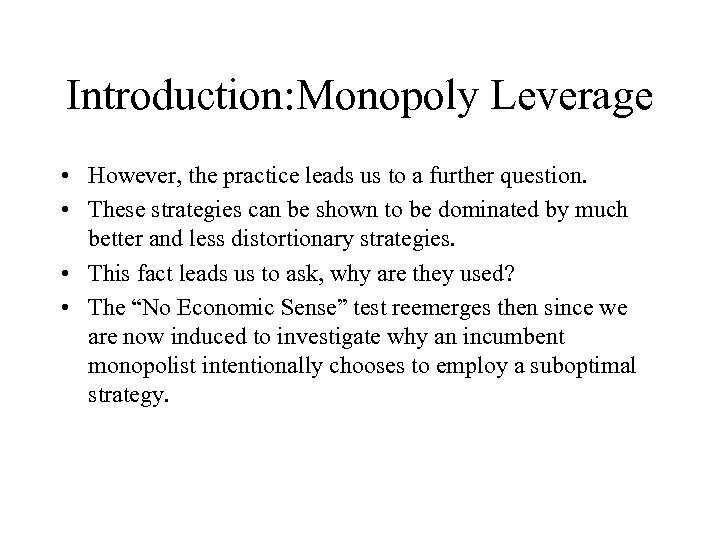 • The “No Economic Sense” test reemerges then since we are now induced to investigate why an incumbent monopolist intentionally chooses to employ a suboptimal strategy. 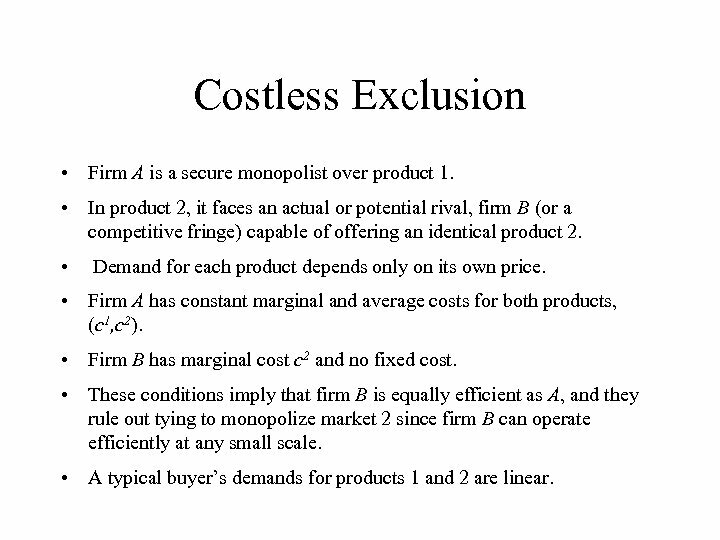 Costless Exclusion • Firm A is a secure monopolist over product 1. • In product 2, it faces an actual or potential rival, firm B (or a competitive fringe) capable of offering an identical product 2. • Demand for each product depends only on its own price. • Firm A has constant marginal and average costs for both products, (c 1, c 2). • Firm B has marginal cost c 2 and no fixed cost. • These conditions imply that firm B is equally efficient as A, and they rule out tying to monopolize market 2 since firm B can operate efficiently at any small scale. • A typical buyer’s demands for products 1 and 2 are linear. 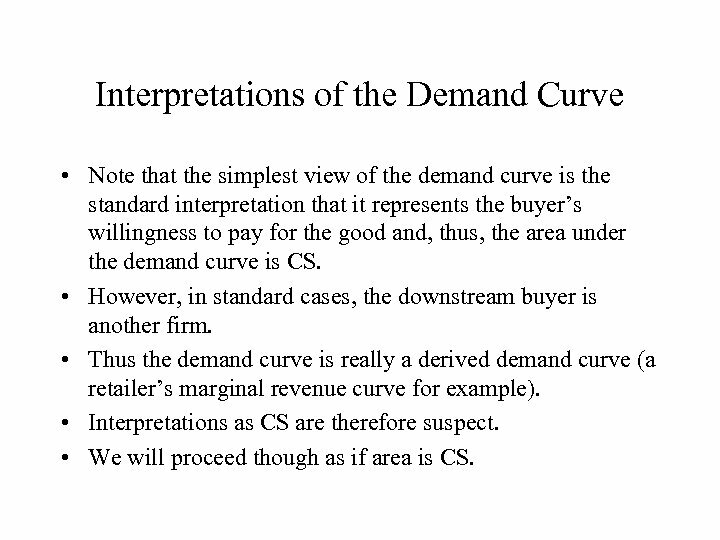 Interpretations of the Demand Curve • Note that the simplest view of the demand curve is the standard interpretation that it represents the buyer’s willingness to pay for the good and, thus, the area under the demand curve is CS. • However, in standard cases, the downstream buyer is another firm. • Thus the demand curve is really a derived demand curve (a retailer’s marginal revenue curve for example). • Interpretations as CS are therefore suspect. • We will proceed though as if area is CS. 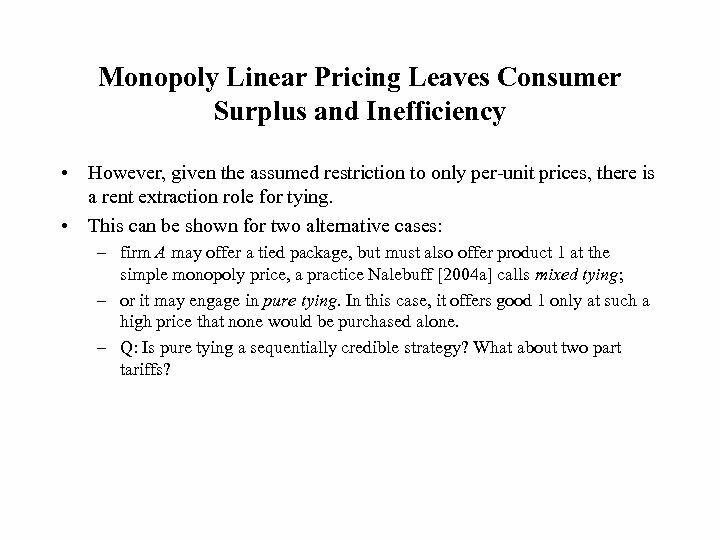 Monopoly Linear Pricing Leaves Consumer Surplus and Inefficiency • The simple monopoly price-quantity point is m 1 in market 1 and m 2 in market 2. • These are the price-quantity pairs firm A would choose if it were an unconstrained monopolist in both markets / products. • If firm A faces perfect competition in 2 and cannot tie its products, it stays at m 1 but prices 2 at marginal cost, leading to the socially efficient point in market 2, e 2. 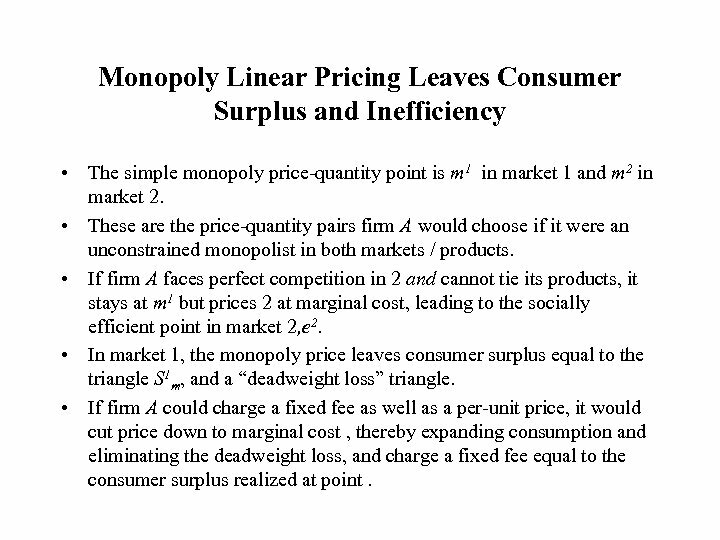 • In market 1, the monopoly price leaves consumer surplus equal to the triangle S 1 m, and a “deadweight loss” triangle. • If firm A could charge a fixed fee as well as a per-unit price, it would cut price down to marginal cost , thereby expanding consumption and eliminating the deadweight loss, and charge a fixed fee equal to the consumer surplus realized at point. Monopoly Linear Pricing Leaves Consumer Surplus and Inefficiency • However, given the assumed restriction to only per-unit prices, there is a rent extraction role for tying. 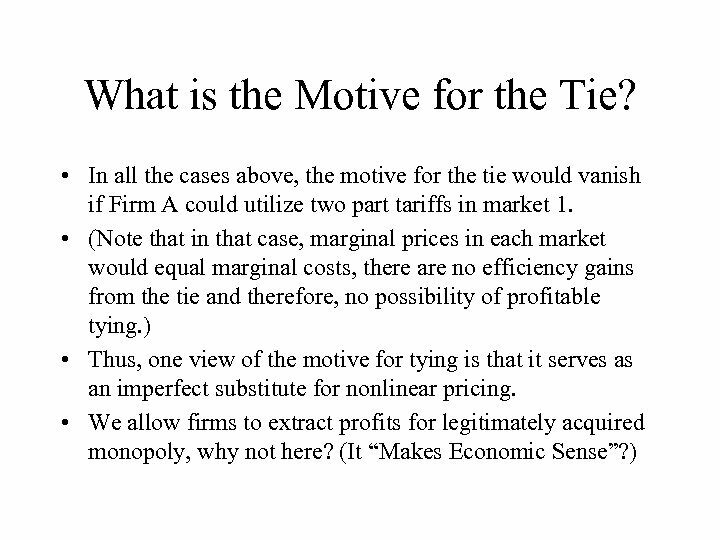 • This can be shown for two alternative cases: – firm A may offer a tied package, but must also offer product 1 at the simple monopoly price, a practice Nalebuff [2004 a] calls mixed tying; – or it may engage in pure tying. In this case, it offers good 1 only at such a high price that none would be purchased alone. – Q: Is pure tying a sequentially credible strategy? What about two part tariffs? 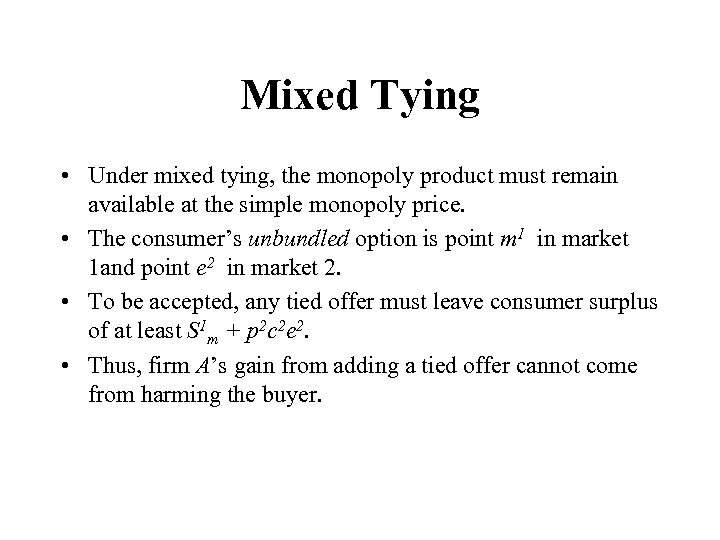 Mixed Tying • Under mixed tying, the monopoly product must remain available at the simple monopoly price. • The consumer’s unbundled option is point m 1 in market 1 and point e 2 in market 2. • To be accepted, any tied offer must leave consumer surplus of at least S 1 m + p 2 c 2 e 2. • Thus, firm A’s gain from adding a tied offer cannot come from harming the buyer. Mixed Tying • Nevertheless, mixed tying can benefit firm A — by reducing the deadweight loss on product 1. • This is done by cutting its price somewhat below the monopoly level while raising the price of 2 somewhat above marginal cost, and requiring buyers to buy 2 at this higher price as a condition for obtaining the lower price on 1. • The deadweight loss will be reduced because starting at the efficient point in market 2, a small rise in price and fall in quantity reduces welfare W only negligibly • But the quantity expansion in 1 increases W significantly. 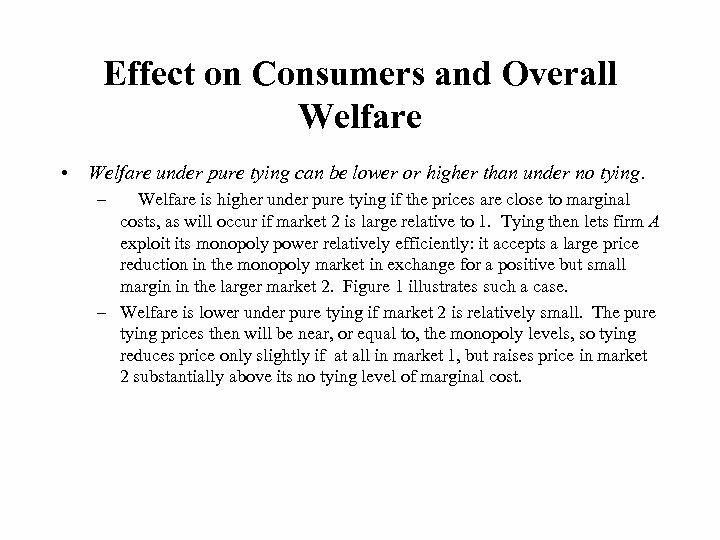 • Since total welfare can be increased, there exists a pair of prices firm A can charge that leave the same consumer surplus as the unbundled option but yields higher profit. Mixed Tying • Geometrically, to maintain , the mixed tying prices are set so that the consumer’s gain from the price cut on product 1 (trapezoid p 1 mm 1 x 1 p 1 xt in Figure 1) equals the loss from the price rise on product 2 (trapezoid c 2 e 2 x 2 p 2 xt ). We return to this property of the mixed-tying prices when discussing the Ortho test. • Observe that this pricing pattern still leaves both quantities below their efficient levels and, hence, is still inferior to charging a fixed fee in market 1 and setting both prices at marginal costs. Pure Tying • Firm A may offer product 1 only tied with 2, or also unbundled but at a price of its choosing. • By raising the unbundled price of 1 to a prohibitive level ( or higher), firm A can de facto adopt pure tying, and reduce the consumer surplus under the unbundled option from to , the level available by buying only product 2 competitively. • Thus, pure tying removes the consumer surplus that was available from buying product 1 unbundled at its monopoly price. • Making the unbundled option less attractive lets firm 1 set the puretying prices above the mixed-tying levels discussed above. 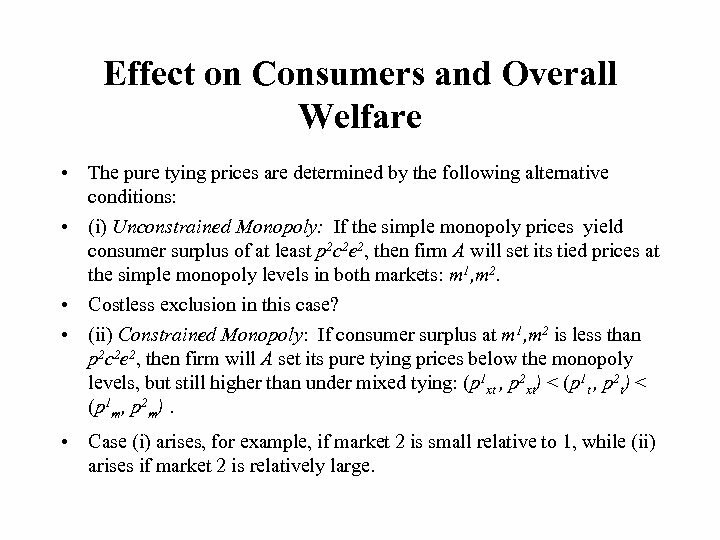 Effect on Consumers and Overall Welfare • The pure tying prices are determined by the following alternative conditions: • (i) Unconstrained Monopoly: If the simple monopoly prices yield consumer surplus of at least p 2 c 2 e 2, then firm A will set its tied prices at the simple monopoly levels in both markets: m 1, m 2. • Costless exclusion in this case? • (ii) Constrained Monopoly: If consumer surplus at m 1, m 2 is less than p 2 c 2 e 2, then firm will A set its pure tying prices below the monopoly levels, but still higher than under mixed tying: (p 1 xt , p 2 xt) < (p 1 t , p 2 t) < (p 1 m, p 2 m). • Case (i) arises, for example, if market 2 is small relative to 1, while (ii) arises if market 2 is relatively large. 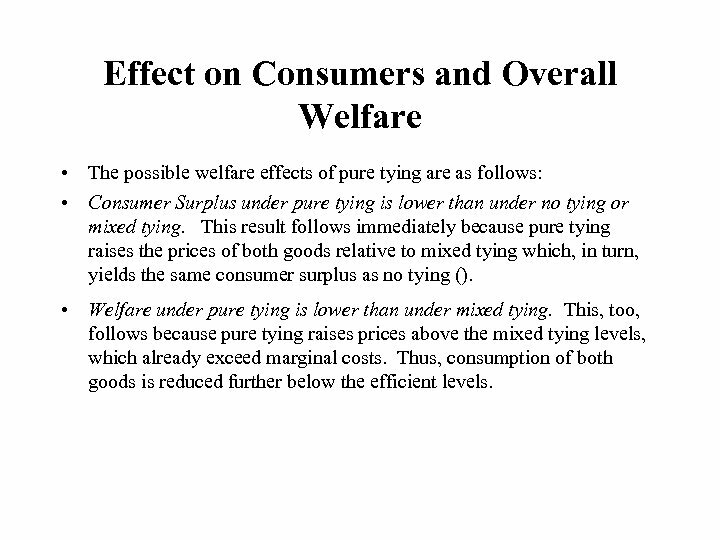 Effect on Consumers and Overall Welfare • The possible welfare effects of pure tying are as follows: • Consumer Surplus under pure tying is lower than under no tying or mixed tying. 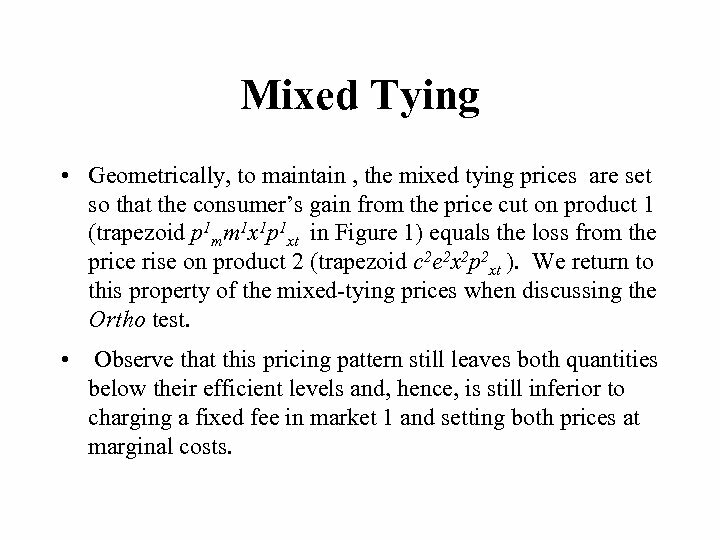 This result follows immediately because pure tying raises the prices of both goods relative to mixed tying which, in turn, yields the same consumer surplus as no tying (). • Welfare under pure tying is lower than under mixed tying. 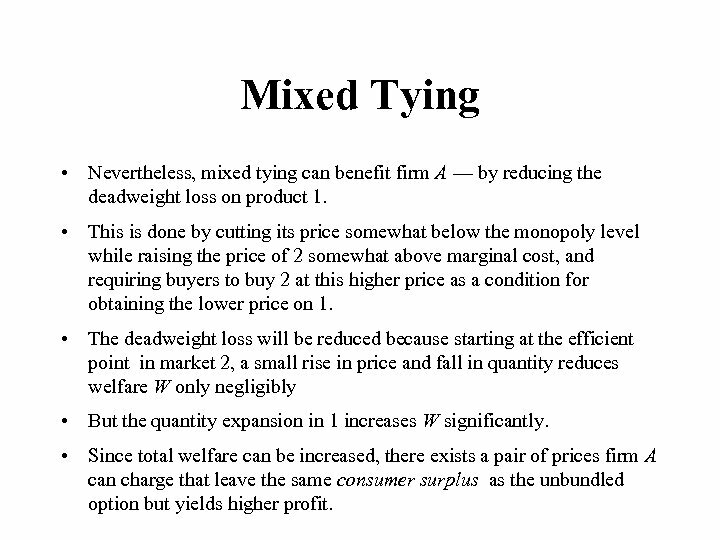 This, too, follows because pure tying raises prices above the mixed tying levels, which already exceed marginal costs. Thus, consumption of both goods is reduced further below the efficient levels. Effect on Consumers and Overall Welfare • Welfare under pure tying can be lower or higher than under no tying. – Welfare is higher under pure tying if the prices are close to marginal costs, as will occur if market 2 is large relative to 1. 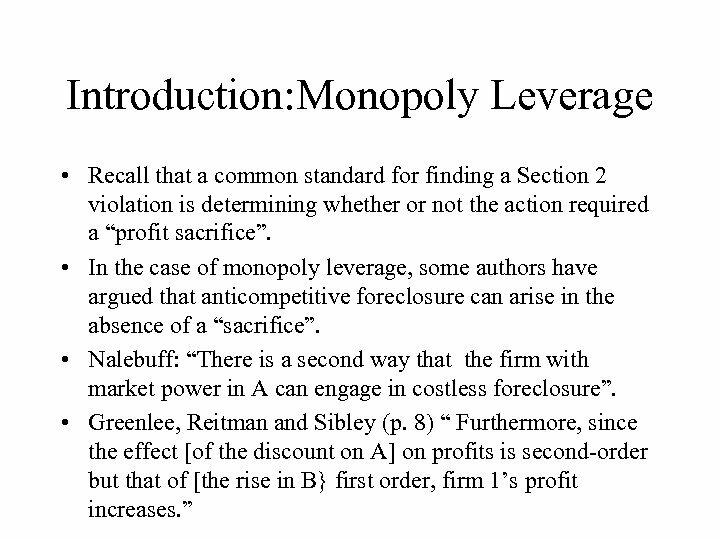 Tying then lets firm A exploit its monopoly power relatively efficiently: it accepts a large price reduction in the monopoly market in exchange for a positive but small margin in the larger market 2. 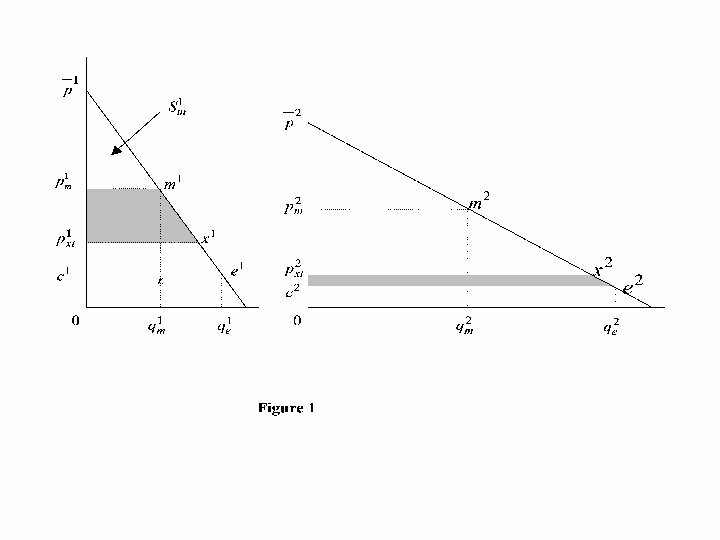 Figure 1 illustrates such a case. – Welfare is lower under pure tying if market 2 is relatively small. 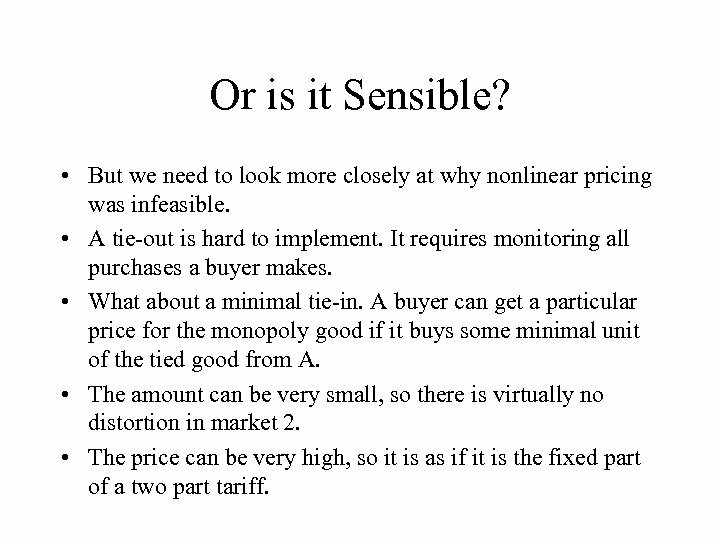 The pure tying prices then will be near, or equal to, the monopoly levels, so tying reduces price only slightly if at all in market 1, but raises price in market 2 substantially above its no tying level of marginal cost. 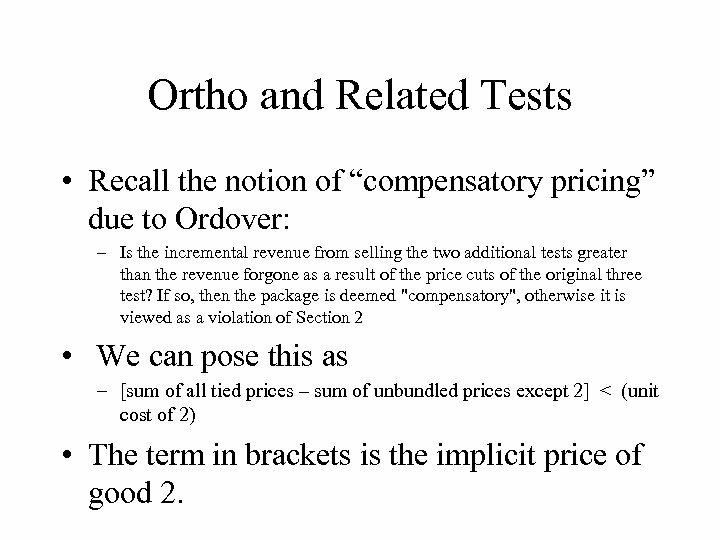 Ortho and Related Tests • Recall the notion of “compensatory pricing” due to Ordover: – Is the incremental revenue from selling the two additional tests greater than the revenue forgone as a result of the price cuts of the original three test? If so, then the package is deemed "compensatory", otherwise it is viewed as a violation of Section 2 • We can pose this as – [sum of all tied prices – sum of unbundled prices except 2] < (unit cost of 2) • The term in brackets is the implicit price of good 2. 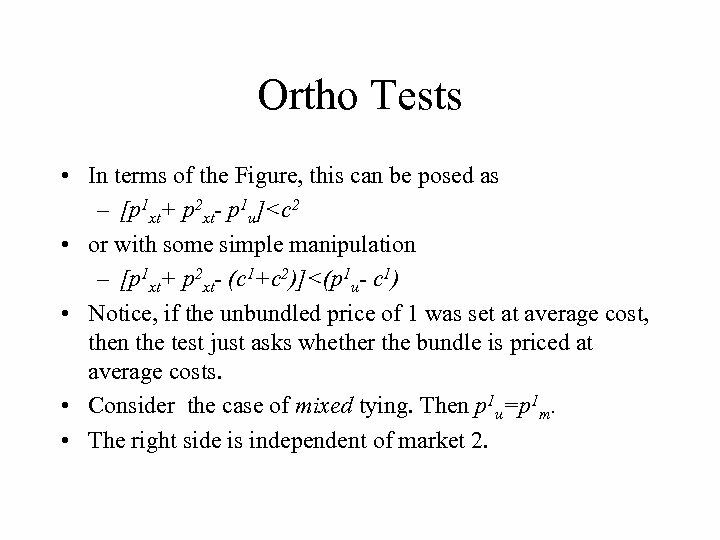 Ortho Tests • In terms of the Figure, this can be posed as – [p 1 xt+ p 2 xt- p 1 u]<(p 1 u- c 1) • Notice, if the unbundled price of 1 was set at average cost, then the test just asks whether the bundle is priced at average costs. • Consider the case of mixed tying. Then p 1 u=p 1 m. • The right side is independent of market 2. 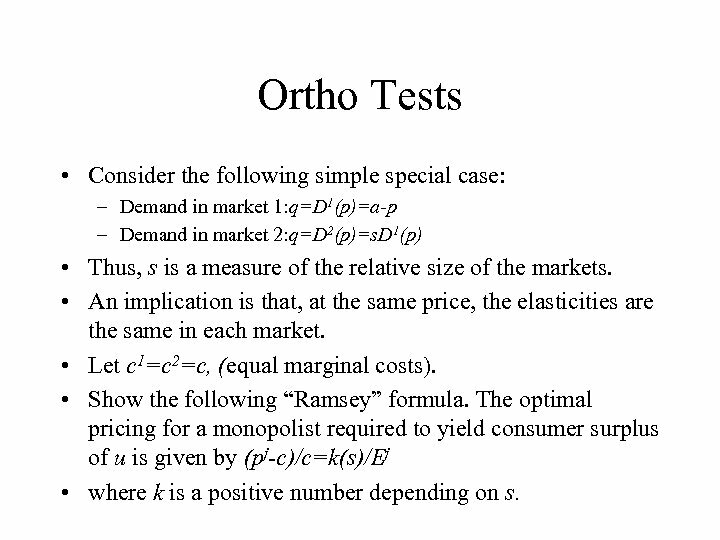 Ortho Tests • Consider the following simple special case: – Demand in market 1: q=D 1(p)=a-p – Demand in market 2: q=D 2(p)=s. D 1(p) • Thus, s is a measure of the relative size of the markets. • An implication is that, at the same price, the elasticities are the same in each market. • Let c 1=c 2=c, (equal marginal costs). • Show the following “Ramsey” formula. 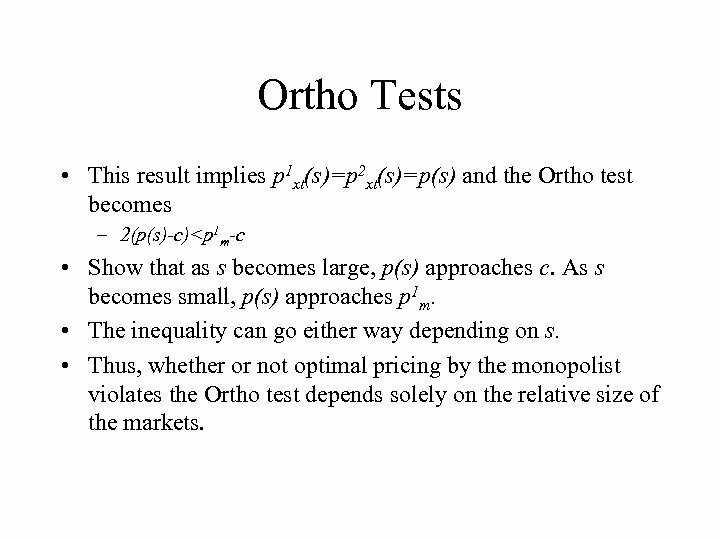 The optimal pricing for a monopolist required to yield consumer surplus of u is given by (pj-c)/c=k(s)/Ej • where k is a positive number depending on s.
Ortho Tests • Recall that under mixed tying, total welfare always goes up. 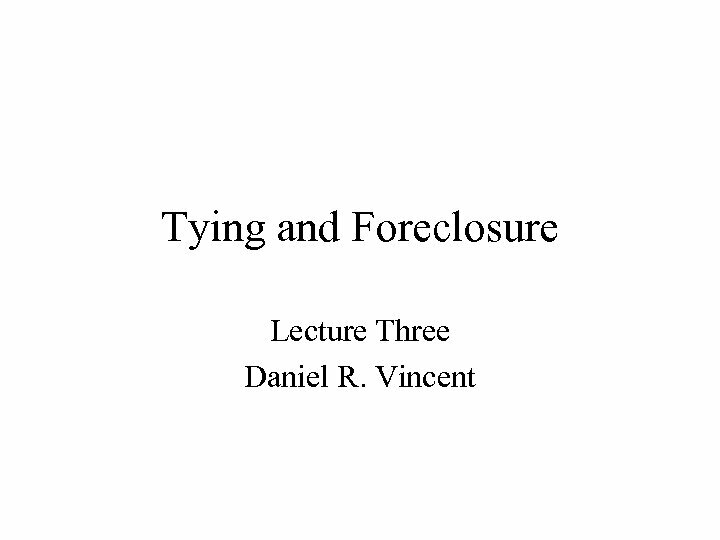 • Since by assumption, there is never an issue about foreclosure, so the motive is pure rent extraction by the monopolist. 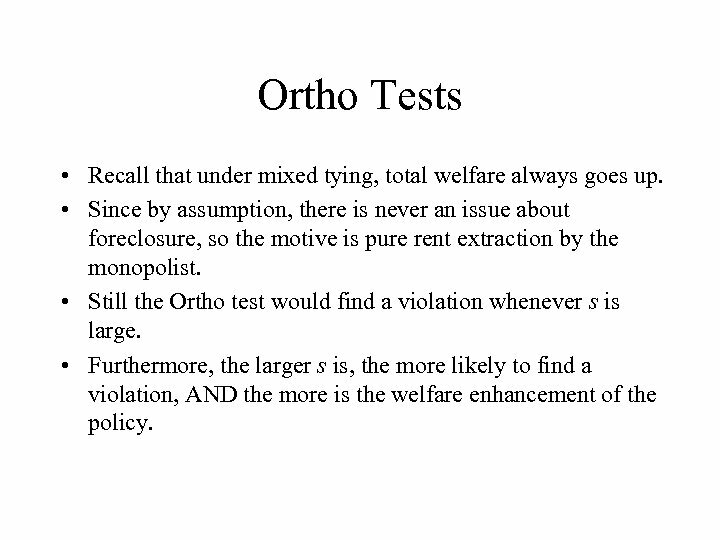 • Still the Ortho test would find a violation whenever s is large. • Furthermore, the larger s is, the more likely to find a violation, AND the more is the welfare enhancement of the policy. 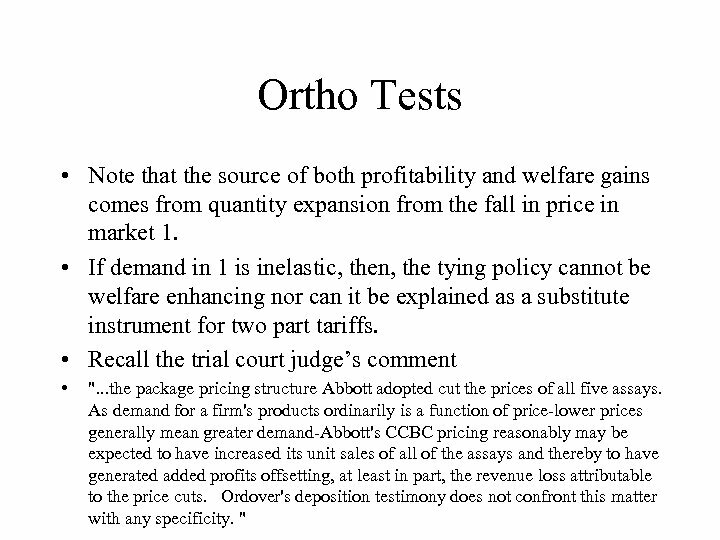 Ortho Tests • Note that the source of both profitability and welfare gains comes from quantity expansion from the fall in price in market 1. • If demand in 1 is inelastic, then, the tying policy cannot be welfare enhancing nor can it be explained as a substitute instrument for two part tariffs. • Recall the trial court judge’s comment • ". . . the package pricing structure Abbott adopted cut the prices of all five assays. As demand for a firm's products ordinarily is a function of price-lower prices generally mean greater demand-Abbott's CCBC pricing reasonably may be expected to have increased its unit sales of all of the assays and thereby to have generated added profits offsetting, at least in part, the revenue loss attributable to the price cuts. Ordover's deposition testimony does not confront this matter with any specificity. " 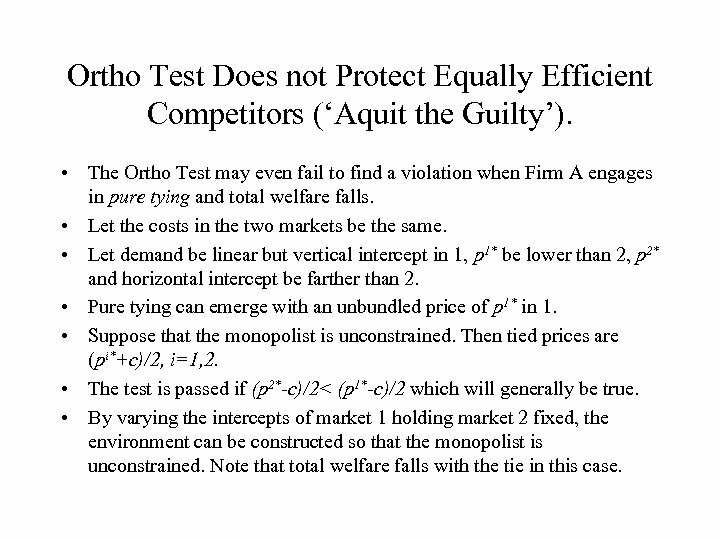 Ortho Test Does not Protect Equally Efficient Competitors (‘Aquit the Guilty’). • Note, that by assumption of the example, c 2=c for Firms A and B. • Mixed or pure tying in this scenario would always lead Firm A to “foreclose” B. • But an Ortho test may NOT find a violation (if s is small in the example). • Thus, it cannot “protect” equally efficient competitors. 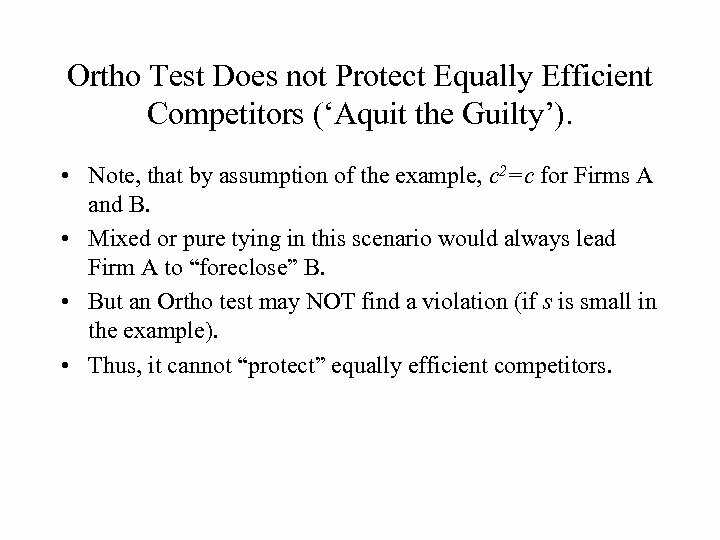 Ortho Test Does not Protect Equally Efficient Competitors (‘Aquit the Guilty’). • The Ortho Test may even fail to find a violation when Firm A engages in pure tying and total welfare falls. • Let the costs in the two markets be the same. • Let demand be linear but vertical intercept in 1, p 1* be lower than 2, p 2* and horizontal intercept be farther than 2. • Pure tying can emerge with an unbundled price of p 1* in 1. • Suppose that the monopolist is unconstrained. Then tied prices are (pi*+c)/2, i=1, 2. • The test is passed if (p 2*-c)/2< (p 1*-c)/2 which will generally be true. • By varying the intercepts of market 1 holding market 2 fixed, the environment can be constructed so that the monopolist is unconstrained. Note that total welfare falls with the tie in this case. Or is it Sensible? • But we need to look more closely at why nonlinear pricing was infeasible. • A tie-out is hard to implement. It requires monitoring all purchases a buyer makes. • What about a minimal tie-in. A buyer can get a particular price for the monopoly good if it buys some minimal unit of the tied good from A. • The amount can be very small, so there is virtually no distortion in market 2. • The price can be very high, so it is as if it is the fixed part of a two part tariff. Or is it Sensible? 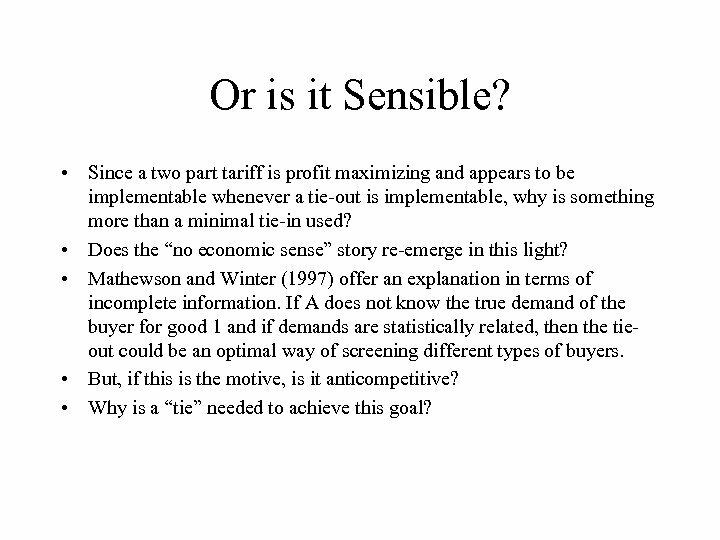 • Since a two part tariff is profit maximizing and appears to be implementable whenever a tie-out is implementable, why is something more than a minimal tie-in used? • Does the “no economic sense” story re-emerge in this light? • Mathewson and Winter (1997) offer an explanation in terms of incomplete information. If A does not know the true demand of the buyer for good 1 and if demands are statistically related, then the tieout could be an optimal way of screening different types of buyers. • But, if this is the motive, is it anticompetitive? • Why is a “tie” needed to achieve this goal? Exclusion? • The logic seems to lead us to the observation that something more than a minimal tie is suspicious. • If Firm A is choosing to use some policy that is other than profit maximizing, why is it giving up this potential profit? • Two questions in fact. 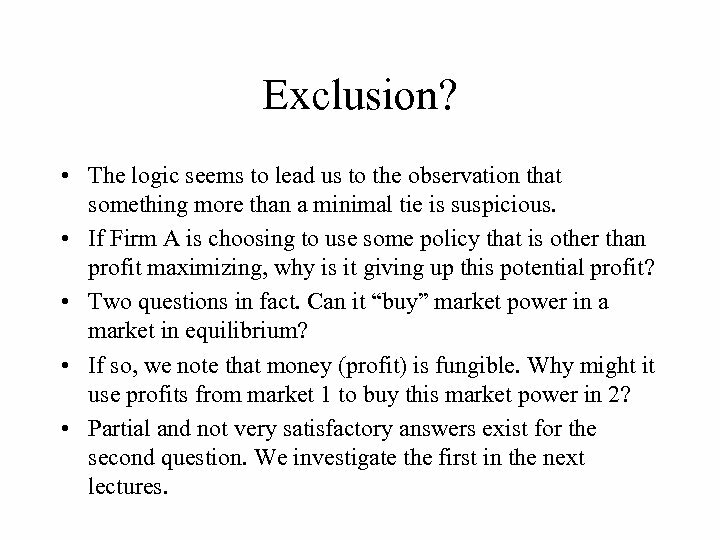 Can it “buy” market power in a market in equilibrium? • If so, we note that money (profit) is fungible. Why might it use profits from market 1 to buy this market power in 2? • Partial and not very satisfactory answers exist for the second question. We investigate the first in the next lectures.